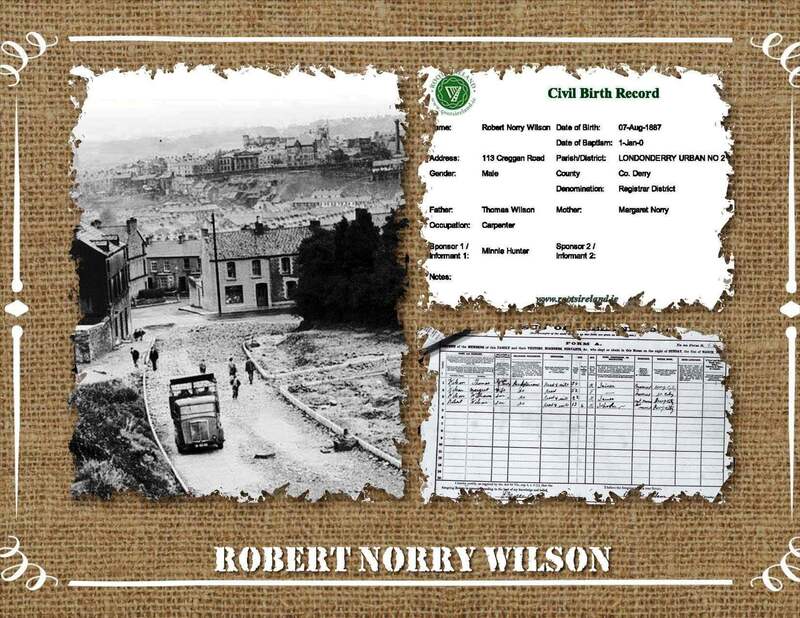 Born in 113 Creggan Road, Londonderry on 7 Aug 1887, Robert Norry Wilson was my great grand uncle. He was one of thirteen children born to Thomas Wilson and Margaret Jane Norry, my 2nd great grandparents. I knew very little about Robert until recently when I started to research the rather unusual family name of Norry! In 1901, at the age of 14, Robert was living in 68 Creggan Road. The 1911 census however showed no trace of him. After exhausting several avenues, and researching many Robert Wilsons, I came across a “Short Service” Record and 1911 Military Census for yet another Robert Wilson. This time it was the correct one! 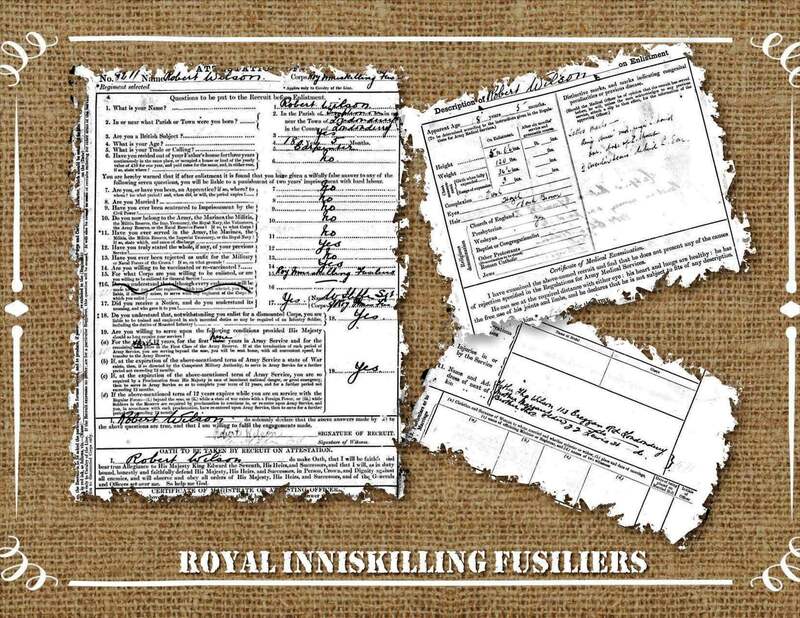 On 9 Jan 1905 Robert joined the Royal Inniskilling Fusiliers by signing the Short Service Attestation and the “Oath to be taken by Recruit on Attestation” in Omagh. The record shows he was a carpenter by trade, born in Londonderry and was 18 years and 5 months old! The record also indicated that Robert was a man of smaller stature standing at 5’ 6 ¼”, 120lbs; with a “fresh complexion”, hazel eyes and dark brown hair. It was noted that Robert had some “distinctive marks”, tattoos and a “ring device” on the middle finger of his left hand. The documents also confirmed that his “Next of Kin” were Thomas and Margaret Wilson of 113 Creggan Road and Thomas Wilson (my great grandfather) of 22 Lewis Street, Londonderry. His service was to be short lived… on 28 Jan 1905, nineteen days after he enlisted, the Statement of Service of No. 8211 – Robert Wilson noted that for the sum of £10 he was “Discharged by Purchase”! At this point in time it’s unclear why Robert was discharged. Was it because he was underage, or did he change his mind about serving in only nineteen short days? I’m leaning towards him being underage – unfortunately, it’s something I’ll never know for sure! 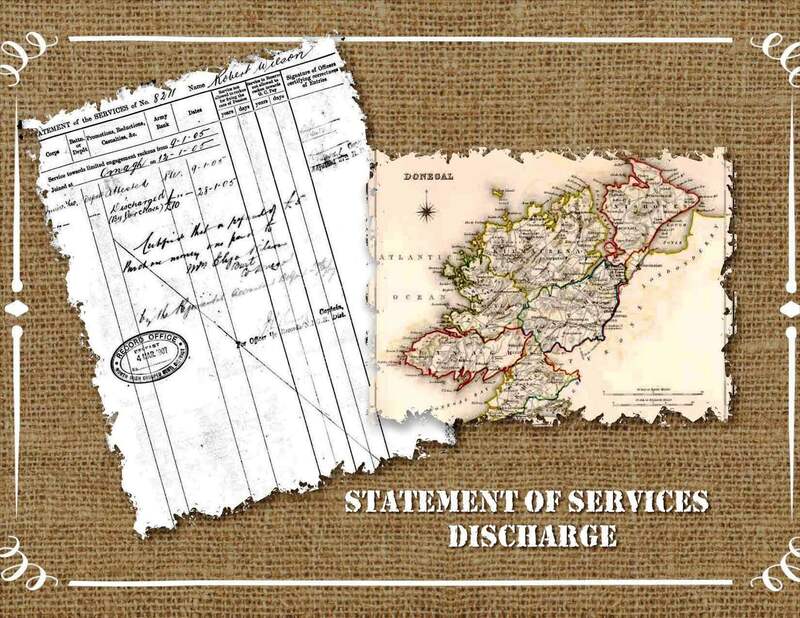 One very faded, short sentence on Robert’s “Statement of Services” read: “Certified that a refund of £5.00 Purchase Money was paid to Mrs. Eliza Wilson, Burt, Co. Donegal by the Regimental Accountant, Belfast”! This was the first time that I had one of my Wilson Crooked Branches lead directly back to Co. Donegal! Once again… my Christmas had come early! Since this discovery I’ve “unearthed” many more of my Wilson and connected families in Burt, Co. Donegal, including burial records for Thomas Wilson (my great grandfather) showing that he was born in Burt, Co. Donegal, however, that’s a story for another time. Not to be deterred… on 12 Nov 1907 Robert once again enlisted in the military. 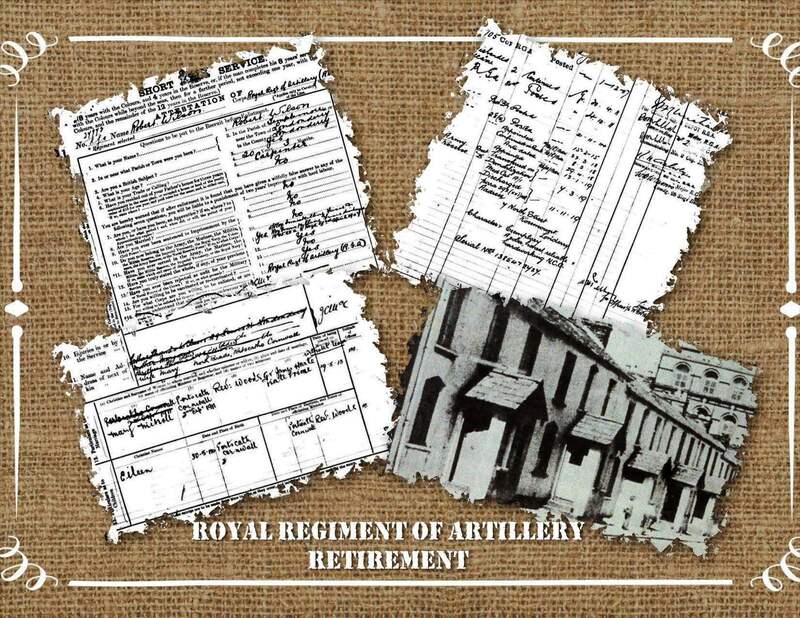 The Certificate of Primary Military Examination revealed that Robert was “fit for service in the Royal Regiment of Artillery (Royal Garrison Artillery)”. On 2 Sep 1911 in Cornwall, England, witnessed by James Harte and Kate Prime; Rev. Wood joined Robert Norry Wilson and Mary Nicholl in marriage. On 30 May 1912 Mary gave birth to their daughter Eileen. Yet another Twisted Limb for me to research further. Robert retired on 11 Nov 1919 after 12 years of service. His final Statement of Service showed Robert’s character as “Exemplary – A sober, honest, reliable hardworking N.C.O”. He returned to 7 North Street, Londonderry where remained, with his wife Mary, until his death on 25 July 1964. He is interred at the Derry City Cemetery with his wife and many of his extended family. I am so grateful for Robert’s “Discharge by Purchase” and the twist of fate that led me back to my Wilson’s in Burt, Co. Donegal. One tiny piece of information has helped unearth many more of my Co. Donegal ancestors! This entry was posted in Burial Records, Co. Donegal, Co. Londonderry, Family History, Geneaology, Ireland and tagged Co. Donegal, Co. Londonderry, Derry City Cemetery, Family History, GeneaBlogger, Ireland, Norry Family, Wilson Family. Bookmark the permalink. 10 Responses to Short Service Record – No. 8211, Robert Norry Wilson! Wonderful CJ, it is always rewarding when an unexpected detail, easily missed, leads back to your direct ancestral trail. It often seems to happen that way—you look for one thing about one person, and you learn a lot of things about others as well. Looking for any information on a mary o’donnell who was born in donegal about 1920. Mary came to glasgow and gave birth to my dad michael john o’donnell in 1939.